First of all, as I’ve mentioned above, The Elephant Walk is a bit of a culinary oddity with a combined French and Cambodian menu, especially since there isn’t a lot of fusion going on here: the menu lists “Traditional Cambodian”, “Original Cambodian”, and “Original French” as separate menu sections, but my visits here have never strayed from the Cambodian menus thus far (since I’ve got a much wider variety of French places I can draw upon). But there are a lot of great options here, including several somlahr (soups), roulleaux (spring rolls), loc lac (a marinated beef dish), and amok trey (fish wrapped in spice paste and steamed in banana leaves, similar to an Indian chutneywala). For me, it was a relatively straightforward choice: I ordered up some roulleaux and the nightly soup special, Somlah Machou (sour soup). Carol ordered the same main dish, along with a chilled avocado and citrus soup appetizer. Starting with the appetizers, I was as pleased as always by the spring rolls here. 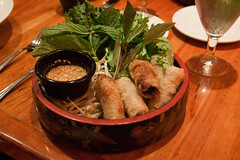 Cambodian roulleaux are really similar (differing only slightly in spicing) to Vietnamese fried spring rolls (cha gio). The Elephant Walk are a great example of fried spring rolls done well. And they certainly don’t skimp with the vegetables, so an order of roulleaux comes out with arather bountiful plate of basil, lettuce, mint, and sprouts. I always love spring rolls they are done nicely (I still have fond memories of when I first discovered Vietnamese cha gio at a now-defunct Vietnamese phở joint in Scottsdale, AZ), with nice tender and moist interiors, tangy sauce, crisp wrappers, and fresh veggies, and the roulleaux at The Elephant Walk met this mark quite nicely. 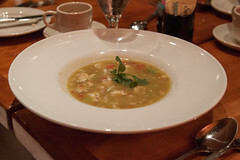 Carol’s soup appetizer, the Chilled Avocado Citrus Soup, was a very pleasant surprise for both of us. This was one of those dishes that I was surprised I liked at all, since it’s the type I’d never order—I’m not particularly a fan of either avocados nor chilled soup. However, the resulting soup was very pleasant: a rich, savory yet citrusy soup with light spicing, this was one of the best chilled soups I’ve ever sampled. I’ve already tracked down the recipe (on WBUR’s web site), and we’re going to try and recreate this one on our own. For my main course, I opted for the Somlah Machou Kroeung Saik Chrouk (sour soup with kroeung and pork), and this was a quite pleasant main dish: several large chunks of very tender and flavorful pork in a rich sour broth tasting of kroeung, a Cambodian spice paste made from lemongrass, shallots, garlic, kaffir, chiles, and galangal. It’s really quite a flavor explosion, but it works quite well with the pork. Aside from a slight saltiness (pervasive through most of the meal, actually), this was a very satisfying and enjoyable dish. 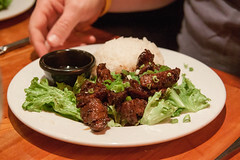 I’ll mention one other dish from the evening, my friend Steve ordered the Loc Lac (cubed beef in a garlic pepper sauce), another classic Cambodian dish. While I didn’t sample his on this visit, I’ve had this on previous trips, and it was a very flavorful and spicy beef dish. It still looked good on this visit, and remains one of the dishes I’d recommend. 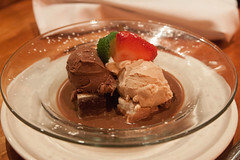 For dessert, we ended up going pure French, with their Moka Liegeois. For those that haven’t had it, Liegeois is a classic French dessert of lightly sweetened cold coffee, ice cream and cream, usually served as a parfait. The Elephant Walk has a nice version of this done in a mocha style, with two house-made ice creams (coffee and chocolate) over a layered almond, coffee, and chocolate cake, drenched with sweet cold coffee. I rather enjoyed it, although I would have liked more of the rather pleasant layered cake included. Overall, The Elephant Walk was a reasonable success. 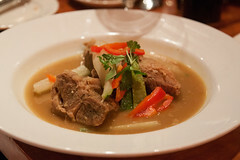 I enjoyed all of my dishes, got to introduce some friends to Cambodian food (although admittedly some of them didn’t enjoy it as much as I do), and they were able to handle a booking for six people for a busy Friday night. I hope to be back several times, either here or the Boston location. A byproduct of several of my projects at work is that we regularly have to visit Lakehurst, NJ. Between schedule and flexibility, we almost always end up driving down there and back with an overnight stay (having tried almost every route between here and there, we’ve got it down to a fairly reliable 5 hour trip each way). We usually carpool, rendezvousing at the Ascutney, VT exit off of I-91, and that’s given me more than a few opportunities to check out a few of Claremont, NH’s more obscure eateries on my home. In this case, my last trip had me arriving in Claremont around dinner time, and that was a great excuse to pay a visit to Sunshine Cookshop, a Jamaican place on South Pleasant Street.